Stay dry -- wet clothing chills the body rapidly. Sweating increases heat loss so remove extra layers whenever you feel too warm. Avoid getting gasoline or alcohol on your skin while de-icing and fueling your car. These materials in contact with the skin greatly increase heat loss from the body. Avoid Exertion. Cold weather puts an extra strain on the heart. If you have heart disease or high blood pressure, avoid doing hard work in the cold. If you have to do heavy outdoor chores, dress warmly and work slowly. Remember, your body is already working hard just to stay warm, so don’t overdo it. 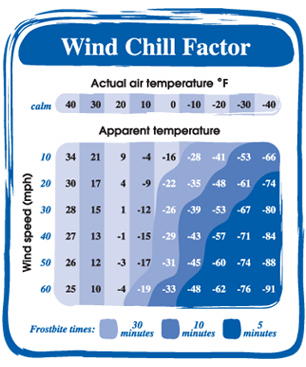 Understand wind chill. As the speed of the wind increases, it can carry heat away from your body much more quickly, causing skin temperature to drop. Avoid Ice. Walking on ice is extremely dangerous. Many cold-weather injuries result from falls on ice-covered sidewalks, steps, driveways, and porches. Notify friends and family where you will be before you go outdoors. Go with friends -- it'll be more fun, too. Be prepared to take emergency shelter. Do not use alcohol or other mood altering substances before going outdoors. We want you to come back next year, so stay safe during this one!